Ford first launched the Cobra Jet in 1968 and revived it in 2008. 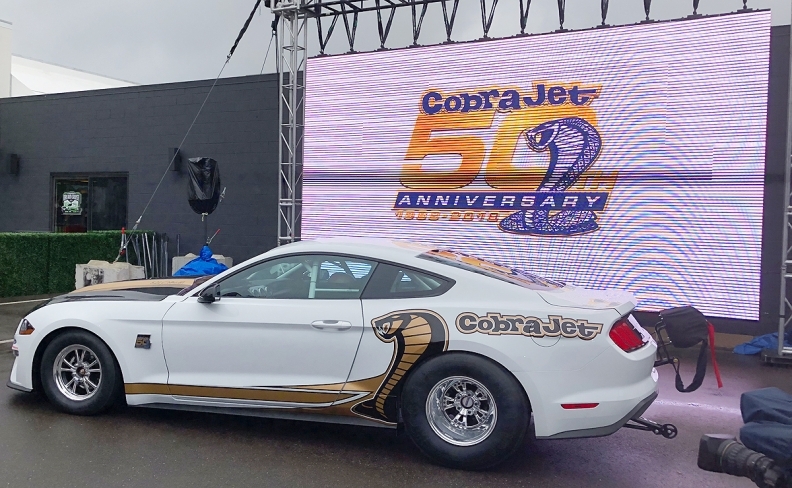 DETROIT -- Ford's 50th anniversary edition of its Mustang Cobra Jet drag racer -- billed at the automaker's fastest, most powerful racing Mustang yet -- will be priced at US$130,000 in Canada when it goes on sale next year. The car was unveiled Thursday in the Detroit suburb of Royal Oak as part of the lead-up to this weekend's annual Woodward Dream Cruise. A Ford Canada spokeswoman didn't say Thursday how many will be available in Canada or what the Canadian price tag will be — just that it will cost US$130,000, which would be C$171,000 at today's exchange rate. The vehicle is powered by a special 5.2-litre V-8 engine paired with a 3.0-litre Whipple supercharger and can achieve a mid-eight-second quarter-mile time, executives said. It is not street-legal. "This has inspired generations of Mustang fans to create their own performance machines for the street," Eric Cin, global director, Ford Performance Parts, said in a statement. Ford first launched the Cobra Jet in 1968 and revived it in 2008. From 2009 to 2016, it's offered the car every other year and has built 50 each time it's offered. It will build slightly more -- 68 -- this time around in honor of the 50th anniversary. It will be available in two colors: Race Red or Oxford White. Executives declined to discuss horsepower or other performance figures. The car is designed to be legal for National Hot Rod Association drag racing, along with several National Mustang Racers Association and National Muscle Car Association classes.